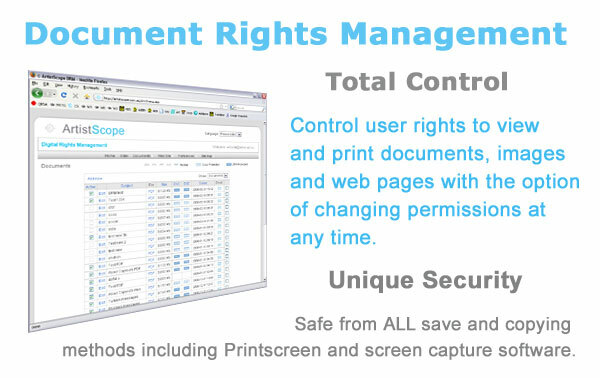 ArtistScope DRM is a total control solution for the Document Rights Management of documents, images and web pages where an author can assign different permissions per user or group of users. When DRM rights are assigned the document becomes "for their eyes only" and any copies of that document forwarded on cannot be viewed by others unless they also have rights of view. Tokens cannot be forged and certificates cannot be copied or redistributed. ...... When a PDF is tagged for DRM each time the end user opens the document your database is checked for their rights of access. The creation of user accounts, document conversion and distribution is managed online and from any computer in the world (optional setting) without having to install software. You can assign administrators and other special users permitted to submit publications, update document permissions or suspend document availability at any time. It converts any DRM protected music files and unprotected music to MP3/WMA/WAV. Qweas is providing links to ArtistScope DRM 2.0 as a courtesy, and makes no representations regarding ArtistScope DRM or any other applications or any information related thereto. Any questions, complaints or claims regarding this application ArtistScope DRM 2.0 must be directed to the appropriate software vendor. You may click the publisher link of ArtistScope DRM on the top of this page to get more details about the vendor.